Listen to a sample of "The Auctioneer"
As is probably the case with many collectors, I'm a sucker for those auction shows on television. You know the ones where they open up an abandoned storage room, and four type-A personalities give dirty looks at one another, and try to outbid each other for whatever junk...er, I mean potentially high-dollar collectibles, are in the locker. On that note, here's an ode to the fast-paced talent of bid calling, courtesy of Dan Potkonjak. Another brick wall attempt to find info on this one. After calling every similar surname in Colorado, nobody offered a hint. Oh well. 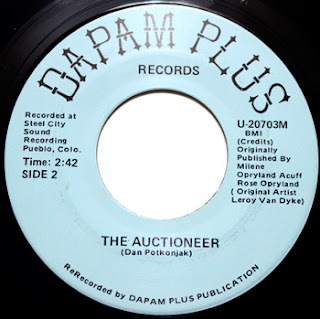 "The Auctioneer" is actually a cover of a 1956 Leroy Van Dyke song, and Dan really lets 'er rip with this nice country ditty (contrary to the credit given on the single, Van Dyke and Buddy Black wrote the song). The a-side is a Potkonjak-penned farmer anthem, "Ain't Givin' Up."